Vedantu.com - No.1 online tutoring company in India provides you Free PDF download of NCERT Solutions for Class 11 Biology Chapter 14 - Respiration in Plants solved by Expert Teachers as per NCERT (CBSE) Book guidelines. All Chapter 14 - Respiration in Plants Exercise Questions with Solutions to help you to revise complete Syllabus and Score More marks. Register for online coaching for AIPMT(NEET), Engineering and Medical entrance exams. 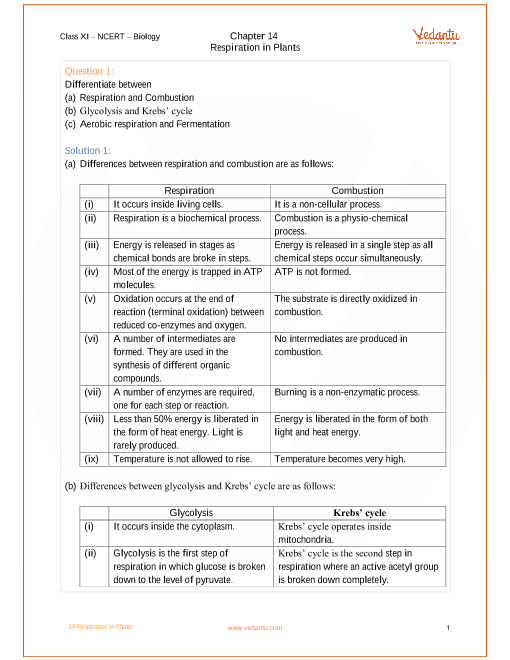 NCERT Grade 11 Biology Chapter 14, Respiration in Plants deals with cellular respiration or the mechanism of breakdown of food materials within the plant cell to release energy, and the trapping of this energy for synthesis of ATP. This chapter is a part of Unit 4, Plant Physiology. Unit 4 contains 5 chapters that deal with various processes within the plant body. Students are already aware about photosynthesis. This chapter deals with topics such as Do Plants Breathe? Glycolysis, Fermentation, Aerobic Respiration, The Respiratory Balance Sheet, Amphibolic Pathway and Respiratory Quotient in plants. Tricarboxylic Acid Cycle and Electron Transport System (ETS) and Oxidative Phosphorylation are the concepts that shall be introduced to the students. These will help for better and in-depth understanding about Plant Respiration. This chapter has a number of reactions and biochemical processes that are described in a very simple manner to enable better understanding. Easy language and sequential description of processes make this chapter interesting and fun to learn. NCERT Grade 11 Biology Chapter 14, Respiration in Plants is a part of Unit 4, Plant Physiology. Unit 4 is a combination of 5 chapters and holds a total weightage of 6% in the NEET examination and 18 marks in the final examination. Get 100 percent accurate NCERT Solutions for Class 11 Biology Chapter 14 (Respiration in Plants) solved by expert Biology teachers. We provide solutions for questions given in Class 11 Biology text-book as per CBSE Board guidelines from the latest NCERT book for Class 11 Biology. The topics and sub-topics in Chapter 14 Respiration in Plants are given below. EX 14.1 - Do Plants Breathe? EX 14.7 - Respiratory Quotient. Chapter 14 Exercises - 12 Questions with Solutions. Other than given exercises, you should also practice all the solved examples given in the book to clear your concepts on Respiration in Plants. Download the free PDF of Chapter 14 Respiration in Plants and take the print out to keep it handy for your exam preparation.